JustGiving is one of the world’s largest online social platforms for charitable fundraising. The London-based organization’s 24 million registered users have helped raise $3.5 billion for more than 13,000 causes as diverse as Alzheimer’s research, Haiti earthquake relief, and initiatives to stop human trafficking. Launched in 2001, JustGiving charges a 5 percent transaction fee on donations, the profits of which are reinvested into the development and innovation of its platform. JustGiving’s growth has been fueled by its integration with social networks, support for mobile donations, social feeds, and the launch of campaigns and crowdfunding products—all of which have enabled JustGiving users to amplify their fundraising, reach more people, and raise more money for good causes. The growth has also challenged the organization’s technology and operations teams, which follow the company’s mission of delivering an engaging and user-friendly experience across all platforms while keeping costs and overhead as low as possible. The dramatic increases in data were also overwhelming the organization’s internal analytics processes, says Richard Freeman, Ph.D., solutions architect and data scientist at JustGiving. “We had been growing our analytics team and capabilities so rapidly that our Microsoft SQL Server data warehouse was unable to process the new data volume, velocity, and query complexity required by our data scientists and analysts,” Freeman says. To address these issues, the company decided to move to the cloud for its general operations and to host a new big-data analytics platform called RAVEN (Reporting, Analytics, Visualization, Experimental, Networks), which would work alongside the existing data warehouse. The goal was to give JustGiving’s data analysts tools for running experiments on clickstream, log, transactional, and external data sources. The analytics team also wanted to run more traditional reporting and examine key performance indicators (KPIs) without the need to continually repeat different extract transform and load (ETL) processes. JustGiving reengineered its software as microservices that are deployed through automated continuous delivery pipelines, using a variety of AWS services to reduce the need for JustGiving staff to support and maintain the infrastructure and to leverage the scalability and resiliency of the AWS platform. These services include Amazon Elastic Compute Cloud (Amazon EC2), Auto Scaling, Elastic Load Balancing, Amazon ElastiCache, Amazon Relational Database Service (Amazon RDS), and Amazon Simple Storage Service (Amazon S3). The organization also uses AWS for its RAVEN analytics platform, relying on several AWS services, including Amazon Redshift, Amazon Elastic MapReduce (Amazon EMR), Amazon Kinesis, AWS Lambda, Amazon DynamoDB, Amazon Simple Queue Service (Amazon SQS), and Amazon Simple Notification Service (Amazon SNS). 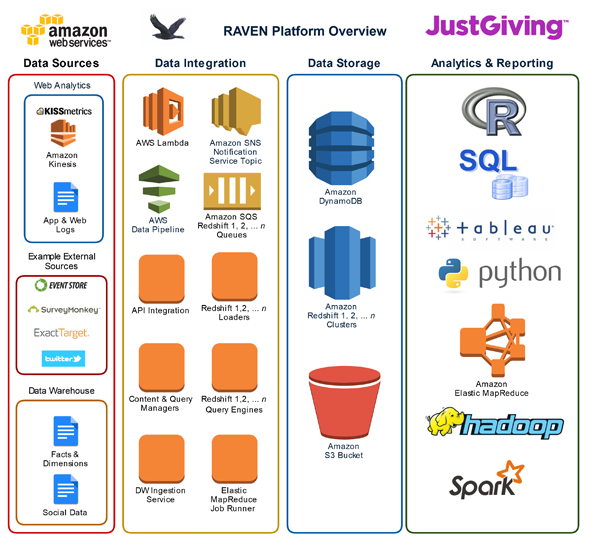 JustGiving's RAVEN (Reporting, Analytics, Visualization, Experimental, Networks) platform architecture on AWS. Freeman lauds the functionality enabled by the AWS platform. “AWS offered exactly what we needed for rapid prototyping, data-science experiments, metrics calculations, and running reports on our big-data analytics platform,” he says. The analytics team uses Amazon Kinesis, AWS Lambda, and Amazon DynamoDB in tandem to perform tasks that were complex to implement in the past. For example, website clickstream events are written in near real time to Amazon Kinesis. An AWS Lambda function runs code in response to events, processing them and writing them to Amazon DynamoDB. Additionally, Lambda is used for testing, event monitoring, and active notification, while DynamoDB is used as a persistent data store for Kinesis events and as a visualization monitoring tool. To learn more about how AWS can help you process and analyze big data, visit our Big Data details page: http://aws.amazon.com/big-data/.